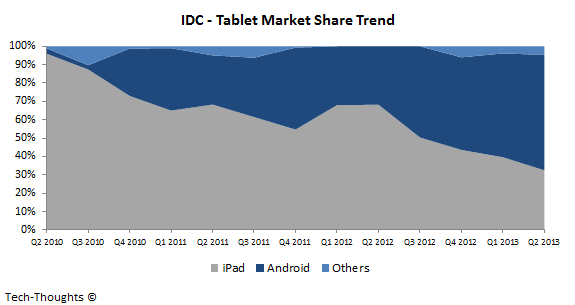 IDC released their tablet market estimates last week that showed the overall tablet market decline by about 10% sequentially. As I expected, Android tablets were responsible for about 62% of quarterly shipments, while the iPad's market share dropped to just 32%. Let's take a deeper look at these figures. 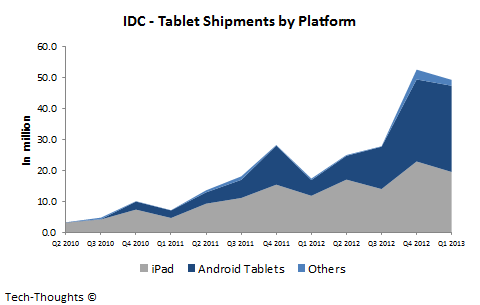 At this point, Android tablets have convincingly taken shipment leadership from the iPad. iPad sales declined to 14.6 million units in the quarter, much lower than expected, while Android shipments grew modestly to 28.2 million units. Windows 8 & RT tablets are practically rounding errors as shipments were roughly flat from already low Q1 levels. Apart from the iPad, Samsung, Amazon and Asus also saw tablet shipments decline sequentially because of the lack of new product launches. However, Lenovo, Acer and smaller vendors saw strong growth, mainly in emerging markets. Mature market tablet purchases are highly cyclical, but emerging market demand has had a stabilizing effect on Android tablet shipments. The combination of modular competition and the lack of a product refresh should cause another sequential decline in iPad shipments in Q3. On the android front, the new Nexus 7 and Kindle Fire models should give Asus and Amazon a shipment boost next quarter while smaller vendors continue to gain ground. 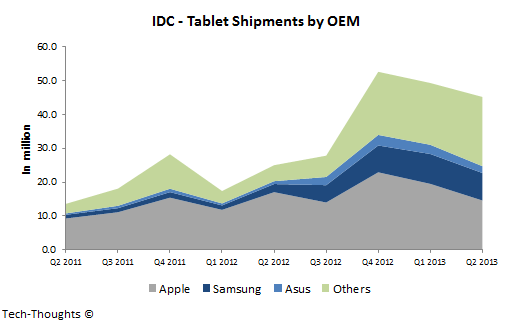 The iPad should see a revival of sorts in Q4, but at this point it is unlikely to make major market share gains.